Balletto Vineyards and Winery is set amongst fields of grapes. It has a peaceful pavered patio, covered with a pergola and centered on an olive tree growing out of a large water feature. Inside, the cozy tasting room is staffed with friendly people who are very knowledgeable about the wine they serve. 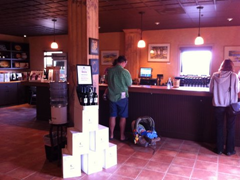 There is a $5 tasting fee, waived with purchase or for Visa Signature card holders. At Balletto they actually have nine different properties, with over 600 acres, but they sell off 90% of their wine to other wineries. Unusually for us, we tasted not one, but two different white wines before moving on to red wine. 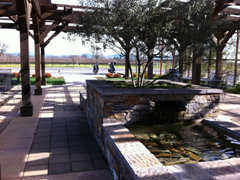 The lovely, tranquil patio at Balletto Winery is centered on an olive tree growing in a large water feature. 2007 Estate Chardonnay, $14.40 – This wine won a Gold Medal and Best of Class at the San Francisco Chronicle Wine Competition and we can see why! Nice and clean and fruity with plenty of lemon and the perfect amount of acidity. This wine was a great start to our tasting at Balletto. 2008 Gewurztraminer – Made from grapes grown along Piner Road in the Russian River Valley. With lots of tropical fruit flavors, plenty of citrus and a lovely pear finish, this wine would make a great summer wine! A bottle came home with us. 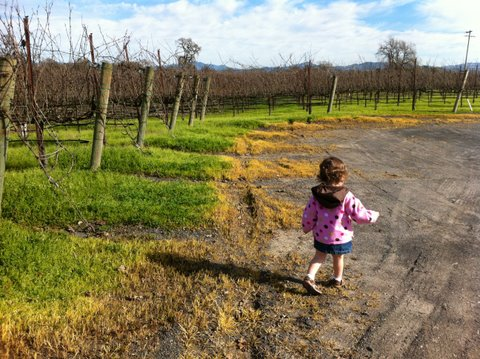 Going for a run amongst the grape vines at Balletto Winery. Traveling with kids? 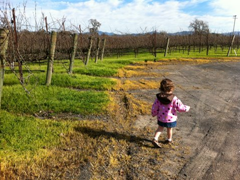 Don't rule out wine tasting for family travel! 2009 Estate Pinot Noir – This wine took the Gold Medal at the Sonoma County Harvest Fair, but failed to excite us. We found it too light, even for a Pinot. 2008 Pinot Noir Winery Block – Despite its Double Gold Medal at the San Francisco Chronicle Wine Competition this Pinot with it’s violet aroma left us unimpressed. 2006 Zinfandel – This Russian River Valley Zinfandel has an unexpected hint of spice. It was just ok; we weren’t overly excited by it. 2006 Syrah – This is a relatively mild Syrah with only a light pepper. We enjoyed its big, bold taste.